The term “renewable” is now magical when applied to energy policy. We understand intuitively that fossil fuels are fixed, not renewable. Even if they are abundant now, every bit of coal, oil, or natural gas we use means there is less available, and their use causes a host of environmental and national security problems. If an energy supply were renewable, it would be a desirable replacement for fossil fuels. This was the simple logic of the federal Energy Policy Act of 2005, including a provision to establish a renewable fuel standard. Renewability equals goodness. A host of interest groups, including many environmentalists, have lined up to support almost any energy source that can carry the adjective renewable. I suggest three better ways to think about energy policy – energy return on energy invested, also called net energy; power density; and life cycle assessment. All three are more abstract and less intuitive than renewability. Yet all three would contribute to better energy policy. Energy return on energy invested (EROI) mirrors the idea of returns on financial investments. This metric accounts for the fact that any energy source requires other energy sources to capture, move, and transform that energy source into heat, electricity, or work. So the wood for our winter heating requires gasoline and oil for the chain saw, diesel fuel for the machinery to get the logs out of the, more gas to cut and split the wood, diesel to get the couple of cords of wood to our house, and human work (food energy) to haul, stack, and haul it again to the stove. The EROI for wood is the measure of the amount of heat we get for our house from burning the wood divided by the sum of all the energy needed to harvest, process, and deliver the wood. If the result of that calculation is greater than 1.0 then the net energy or EROI is positive; we got more energy out of the system then we put into the system. Energy systems should be thought of in the same way we think of saving money. We would not put $100 in the bank today with the promise of getting $95 back a year from now. So we should not promote energy systems that put in 100 units of energy to get 95 units back, even if the system is deemed “renewable.” We appear to have done this in the case of ethanol from corn, the primary fuel mandated from the EPA’s renewable fuel standard. There is a vigorous debate in the academic literature about whether corn ethanol’s EROI is positive or negative. Scientists supported by the government argue that the EROI is positive, although the amount of net energy is not large. At best the energy out in the form of ethanol is only slightly more than the total energy it took to make this alcohol. Others scientists, notably David Pimentel of Cornell University, suggest that the net returns are negative. The sum of energy to plant, fertilize, irrigate, harvest the corn, to convert the corn to sugars, and to make ethanol from that sugar is greater than the energy in the ethanol. Virtually all of these energy inputs are fossil fuels. If Pimentel and others like him are correct, we are using more fossil fuel energy to make a gallon of ethanol from corn than that gallon of ethanol contains. But it is “renewable,” so it must be good. This strikes me as a stupid policy. It would less fossil fuels to just use them directly. Looking at another popular renewable energy – wind power – we see the usefulness of power density as a metric. Since the wind blows often, if not regularly, it is assumed that its renewability makes it a desirable energy alternative. But it has a very low power density, meaning that it will take a lot more space for the wind infrastructure to deliver the same amount of usable energy we get from fossil fuels, as we can see below from estimates made by Smil. 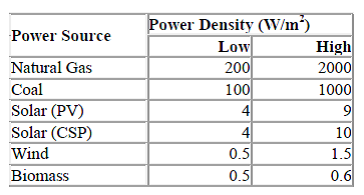 This much lower power density explains why even modest wind power development in Maine is so visible, in some cases degrading vista’s important to Maine’s tourism economy. Wind power’s low power density, and therefore big footprint per unit of energy delivered, also accounts for its negative impacts on birds and bats. A final approach to evaluating alternative energies is Life Cycle Assessment (LCA). Here analysts attempt to measure the full costs of energy systems “from cradle to grave,” including what economists call the external effects. These are the spillover costs when an activity imposes costs on other people that are not accounted for by typical markets where energy resources are traded. LCA would attempt to calculate the full costs of the system, from its initial development to its eventual deconstruction once obsolete. Going back to ethanol from corn, LCA would measure the costs of increased soil erosion and nutrient loading in the Mississippi River and other water bodies adjacent to the dramatically expanded acreage dedicated to corn production because of the Renewable Fuels Standard. It would measure the increased hypoxia in the Gulf of Mexico as these nutrients are flushed down the Mississippi. It would also measure the costs from a decline in Monarch butterfly populations, partly caused by the displacement of milk weed plants throughout the Mid-West by expanded corn acreage for biofuels. Renewable is one of those words with many vague meanings. That is part of its power. It was embraced originally by environmentalist keen to find alternative energy systems to fossil fuels. The problem was that it was also embraced by special interests who saw a way to enhance their narrow interests (sell more industrial corn, develop wind farms) in the guise of improving the environment and national security by offering “renewable” energy alternatives. Lurking behind the rhetoric of renewability were serious environmental problems that we ignored at our own risk.